Adrian Muoio is a freelance writer based in New York City. Muoio writes primarily on contemporary art and culture and contributes exhibition reviews to The Wire, Gothamist and The Budapest Times. Amidst the thousands of ghungroos on the walls and floors, the muted and meditative essence of Vibha Galhotra’s exhibition at Jack Shainman Gallery in New York City is curiously contradictory. It’s somewhat illogical, too. Yet in a show titled Absur -City -Pity -Dity, it makes perfect sense that logic would be left at the door. 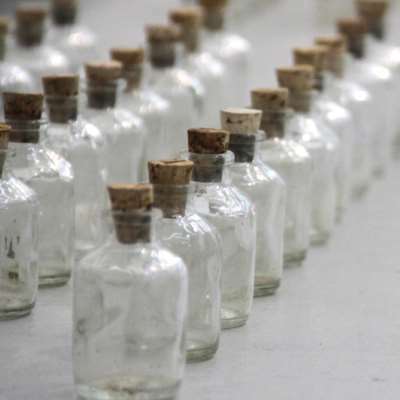 Less than a block from New York’s historic Hudson River, Galhotra’s exhibition focuses aesthetically on the Yamuna - a river that is deemed both immortal by Hindus as a deity and empirically “dead” by scientists for its infamous toxicity levels. 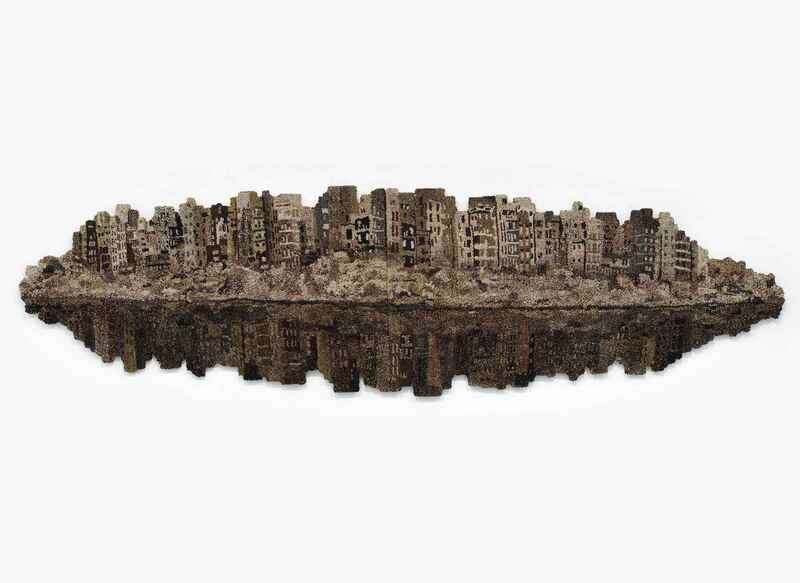 Like the river itself, the Delhi based artist struggles with this dichotomous coexistence in her works. Five large tapestries of ghungroos punctuate the exhibition. In their transfixed state, the pea-sized bells are purely aesthetic; they betray their traditional, percussive function, or rather Galhotra denies them of it. The composition of each work is overwhelmingly dense and the palette is consistently sordid. In one of the more clearly-defined tapestries, Majnu Ka Tila, the congestion of the materials draws a clear correlation to that of the eponymous neighbourhood the work depicts, questioning the merit of its facade of progress. In an installation titled Flow (2015), the ghungroos seem to seep through the meeting point of two walls, puddling in the corner and oozing disconcertingly along the gallery floor. Though even with the more confrontational quality inherent in installation works like Flow, the overall effect of the tapestries is distinctly somber …thousands of alarm bells - individually minuscule but together having the potential to beckon change - all silenced. In many of the pieces, Galhotra moves beyond metaphor, literally using the river and its now defunct ecosystem as her materials. One work is composed solely of an heaping splatter of sediment mixed with resin on glass - a creation cleverly derived from an otherwise deleterious material. In a more niche corner of the gallery, various organic matter suspended in blocks of resin huddle haphazardly on the floor. Particularly through the pale yellow tinge of the resin, the vegetation (all plucked from the Yamuna and its shores) looks both decrepit and sterile; the arrangement is akin to a grouping of fossils from a museum of natural history. 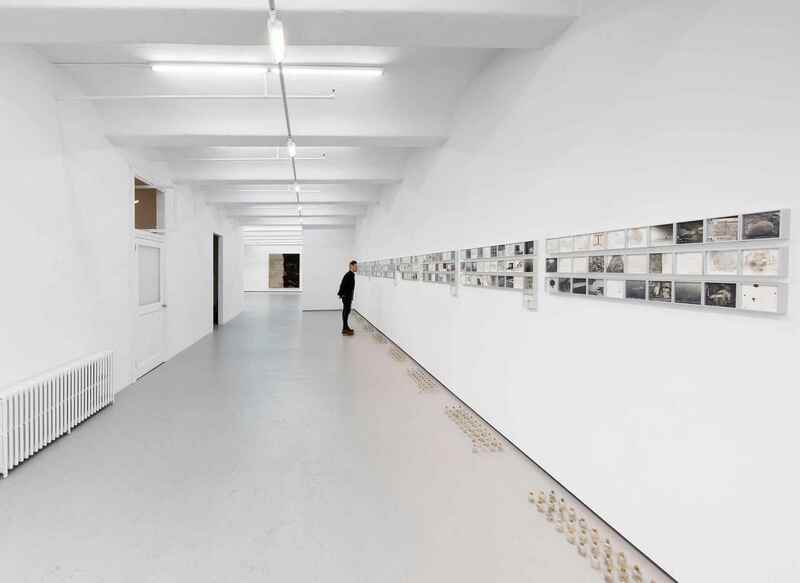 But rather than act in this same scientific vein - as a sterile documentation of life now extinct - Galhotra’s Consumed Contamination series functions more compellingly as both a darkly humorous and forebodingly desperate attempt at preservation. 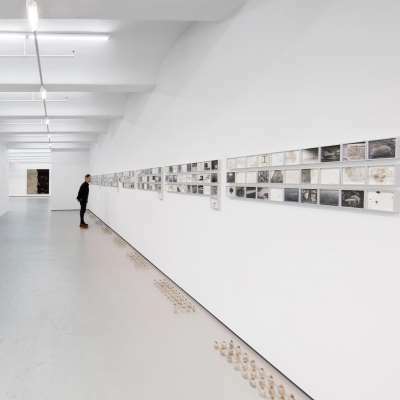 In the very front of the exhibition, 365 notecard-sized drawings hang on the wall like the pages of a calendar, with an equal number of small corked glass bottles reflecting the layout on the floor. 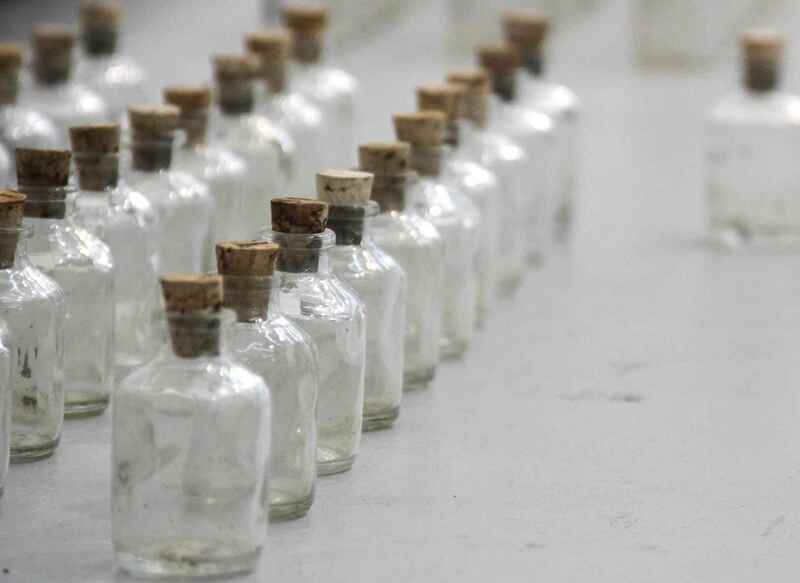 Galhotra composed the work like a collaborative daily log, with one drawing and one water sample for each day of the year. The drawings vary from one to the next, containing some variation of typed text and handwritten scribbles from local residents, and printed or hand drawn images. In every work though, there is a sediment-stain from the river water that Galhotra evidently poured on each piece of paper. 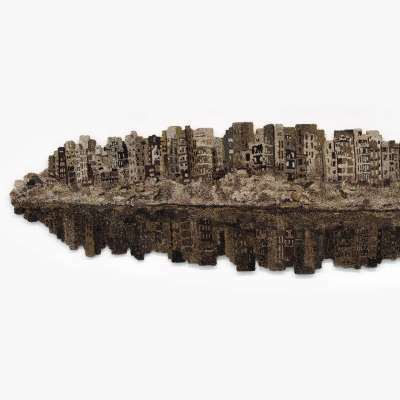 In these works, Galhotra connects the contamination of the Yamuna with larger cultural issues. The associations can get very blunt - one is all white except for a large sediment blotch dividing the words “social pollution” - and after walking through the repetitive and despondent calendar, amelioration seems an impossible undertaking. Yet in her ten-minute video Manthan, Galhotra provides a glimmer of hope. With a group of wetsuit clad performers wading waist-deep in the river and rhythmically churning its water, the film recalls the story of the Samudra Manthan, in which Vishnu calls upon his followers to unite with their enemies and churn the ocean waters in order to release amrit, the nectar of immortality, from its abyss. According to Hindu mythology, many magnificent beings and objects were born in the process. Galhotra’s film lacks the clear narrative structure of its Hindu counterpart, but even so, it presents a similarly optimistic possibility for the achievement of newfound life in the dark stagnant depths of blight. help of local women, to the community-based narrative developed in 365 Days, to the cooperative effort in Manthan - is particularly pertinent. Both the agreement and the exhibition acknowledge similar sentiments; that there is an immediate need to reroute the path we’ve so indifferently and perilously plotted, and that the impetus for change can only derive from a sustained, collective energy.